The term Medieval derives from the Latin words 'medium aevum' meaning the Middle Ages. The Middle Ages are so called as the middle period between the decline of the Roman Empire and prior to the period called the Renaissance. The early Middle Ages are often referred to as the Dark Ages. The period and era of the Medieval times span 1066 - 1485. The Medieval Times encompass one of the most turbulent periods in the History of England and scatter the Medieval History books and other historical documents. Starting with the Battle of Hastings and the Norman Conquest - when William the Conqueror effectively took all of the lands and property from the Saxon English and gave them to his French nobles and knights. The Medieval Times saw the building of the great English castles, including the Tower of London and Dover Castle which helped the Normans to retain their hold on England during the these turbulent times. The Medieval times also saw the start of the Crusades, the knights of the Middle Ages, the religious knights and the the founding of the Knights Templar. The Domesday Book and the Magna Carta were also important events during Medieval times. The Medieval Feudal System were also introduced during the times and the terrible Black Death really did plague the times and period of the Middle Ages. Early Medieval Art was initially restricted to the production of Pietistic painting (religious Christian art) in the form of illuminated manuscripts, mosaics and fresco paintings in churches. There were no portrait paintings. The colors were generally muted. Learn about other aspects of Medieval art and the famous artists of the times including Donatello, Giotto, Leon Battista Alberti, Cimabue, Filippo Brunelleschi, Fra Angelico and Lorenzo Ghiberti. There were also women artists during these times including Claricia - German female artist and nun who illuminated manuscripts in the 12th century, Herrad of Landsberg the Abbess of Hohenburg, Ende - 11th century nun and manuscript illuminator, Guda the German 12th century nun and manuscript illuminator, Diemudis the 12th century Bavarian nun and manuscript illuminator and the most famous of the women artists during the times - Hildegard of Bingen. This section detailing information about Medieval castles illustrate the strength, magnificence and power of the Medieval warlords and their massive stone fortresses. These articles on Medival castles detail the History, Development and Architecture of Medieval Castles, Famous Medieval Castles, Motte and Bailey castles, Concentric Castles and Defending, Destroying and Attacking Medieval Castles. What was life really like in Medieval Times in England? The life of all the classes was dominated by the feudal system. What was Village life and general Daily Life like in England during the times of the middle ages? The daily life and times of a lord, a knight, a noblewoman, a peasant, a peasant woman, a monk and a nun. The jobs and occupations dictated the quality of life during the Medieval times of the Middle Ages in England. Life in Medieval England was dominated by the feudal system. Learn about feudalism in Medieval Times in sections on the Feudalism Pyramid, Feudal Justice and the eventual Decline of Feudalism. The emergence of Manorialism in England is described including sections on Manorialism, Medieval Manors, the Lord of the Manor, the Lady of the Manor and a full description of a Medieval Manor House of Medieval times. Facts and interesting information about the people who lived under the system of feudalism and manorialism. The lives and times of the following Medieval people - the Vassals and the Oath of Fealty, the Fief, Serfs, Peasants and the Villein. Farming in Medieval England. Life in Medieval England also includes an entertainment section and Medival sports providing the History, Facts and Information about the sports and games played during the time of Middle Ages in England. This section details Medieval Music. People in Medieval Times enjoyed various types of music and dance. This section covers the Music of Middle Ages providing information about the music, and musical instruments. There are facts and information about Musical Instruments in Medieval Times, Troubadours and Minstrels. These articles provide an insight into the violent Medieval Times and era. Every man was expected to be able to use weapons during the changing times of the Dark and Middle Ages. There were two types of armed men during the era - The Knights and the Foot soldiers, who included the Archers. Weapons and the training of soldiers during the times of the Middle Ages including a Knights Weapons, the Quintain, Pell Training, Pell Mell and the Butts. The Medival Swords including the Broadsword, the Falchion sword, the Great sword, the Long sword and the Scimitar. The different types of Pole arms that were used as weapons by the peasants during the Medieval times included the Lance, the Halberd, the Pike, the Poleaxe and Spears. This section on Medieval weapons and armor provides interesting facts and information about Battle Axes, Batons, Maces, the Billhook, Caltrops, the Flail, the Quarterstaff, the War hammer, the Longbow and the Crossbow. Medieval Siege Weapons used during the Medieval times of the Middle Ages were the Ballista, Catapult, Mangonel, Battering Ram, Siege Tower and the massive Trebuchet. Gain an understanding of Siege Warfare during the Medieval times of the Middle Ages and Siege Weapon Design. What happened when a castle or town came under siege. The use of the Siege Tower, Catapults and how people in Medieval times used the mysterious Greek Fire. Finally facts and information about a Knights Armor, Chainmail and his war horse called a Destrier. In fact everything you need to now about Medival Knights in these turbulent times. Medieval times history also includes a series of comprehensive Timelines detailing the major events significant to the lives, times and events of the most famous people and the Kings of England and Europe. Articles with facts and information about the religion of the times is included in this section of the website including monasticism and life in the religious orders. Medieval times were dominated by the feudal system and the role of the knights and their servants. There are articles on the life of knights, their living conditions, knights clothing, knights weapons, knights training, knights armor and tournaments and jousts. Included in this section are Facts about Knights, the Steps to Knighthood, the lives of the Squires and Pages culminating in the Order of Knighthood Ceremony. The Medieval Knights Code of Chivalry, rules about Courtly Love and Knights Tournaments. Learn about jousting, the History of Jousting, Jousting Terminology and the Jousting Weapons used by Medieval knights. Pilgrimages to Jerusalem were made by people in Medieval Times who had been guaranteed their safety in the city. In 1065 Jerusalem was taken by the Turks and Christians were treated so badly that throughout Christendom people were stirred to fight in holy crusades. This section about Crusades in these times covers the Crusaders, the Cause of the Crusades, the Effects of the Crusades the history of the First, Second, Third and Fourth Crusades. A Middle Ages Timeline of the First Crusade, the Childrens Crusade, the Minor Crusades. A Crusades Timeline, the Kingdom of Jerusalem, the Holy Land Pilgrimage and the End of the Medieval Crusades of the Middle Ages. A great educational resource for students and teachers researching the crusades of the times. 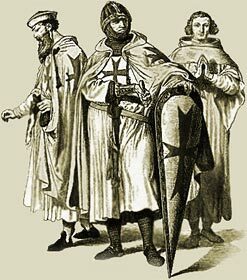 This section also provides facts and information about the Templar Knights, the Knights Templar History, Knights Templar Banking, a Knights Templar Timeline the role of the Religious Knights, the Teutonic Knights and the Knights Hospitaller. We are all horrified and at the same time fascinated by the subject of Medieval torture. The castles of the times with their dark dungeons increase our growing fascination about torture during the violent times of the Middle Ages. The horrific torture chambers and the various torture devices used during the times are described in this section including the Rack Torture, Scavengers Daughter torture, The Brank or Scold's Bridle torture, Ducking Stool, Torture by Dislocation, Iron Balls Torture, Water Torture, The Boot Torture, Branding and Burning Tortures, Brodequins, Thumbscrews and the Pillory. Different types of execution methods are also described in the Medieval times torture and punishment section including being Burned at the Stake, Execution by Quartering, Execution by the Wheel, and finally the gruesome Execution by being Hanged, Drawn and Quartered. Other famous people of the times included with a short biography include Geoffrey of Monmouth, Saladin, Robin Hood, Donatello, Godfrey of Bouillon, Tancred, Hereward the Wake, Albertus Magnus, Erasmus, Jan Hus, John Wycliffe, William of Ockham, Vlad Dracula and Simon de Montfort. Famous Medieval people include great nobles, religious leaders, artists, scientists, military leaders, inventors and explorers - the Medieval heroes and villains of the times. Read books from a history book club or watch the History Channel DVDs on Medieval Times providing biographies of these famous Medieval people. From birth to death, whether you were a peasant, a serf, a noble a lord or a King - life was dominated by the church and Medieval religion. In Europe during the Medieval times the only recognised religion was Christianity, in the form of the Catholic religion. There were various religious institutions, such as monasteries and convents, which are detailed in this section. There were many famous Medieval Saints and there are details of the names of this pious men and women of the Middle Ages. The practises of the Catholic religion were questioned and the beliefs of men such as Martin Luther (1483 - 1546) prompted a new religion called Protestantism. Medieval clothing and fashion like everything else was dictated by the Pyramid of Power which was the Feudal System. Medieval clothes provided information about the status of the person wearing them and was dictated by strict Sumptuary Laws. This section provides information about the type of clothes and fashions worn during the times. Interesting facts and information about Medieval Clothing are detailed in this section: Sumptuary Laws, History of Fashion in the Times, Fashion, Ladies Dresses, Knights Clothing, Lords Clothing, Peasant Clothing, Kings Clothing, Women's Clothing, Monks Clothing in the Times, Nuns Clothes in Medieval Times, simple peasant dresses and finally the different Hairstyles worn by men and women of the times. The lives of Medieval women were dependent on their role and status and the men in their families in the times. All Medieval women were expected to be subservient to the men in their family, including their brothers. What were the daily lives of women like and were women's rights during the Medieval times of the Middle Ages? The Medieval Women section includes facts and information about Queens and Princesses. There is a biography containing key dates and events about the lives of famous Noble women such as Matilda of Flanders, Good Queen Maude, Queen Matilda, Queen Matilda of Boulogne, Eleanor of Aquitaine, Queen Berengaria of Navarre, Isabelle of Angouleme, Eleanor of Provence, Eleanor of Castile, Isabella of France, Philippa of Hainault, Mary de Bohun, Catherine of Valois, Margaret of Anjou, Elizabeth Woodville and Anne Neville. The names of many famous Medieval women scatter the Medieval History books and other historical documents - they were mostly queens and princesses. But what about the women who were not of noble birth, who were not queens or princesses? Learn about the mistresses of famous Medieval men. Medival women of the times such as Anna Comnena, Heloise, Hildegard of Bingen, Julian of Norwich, Christine de Pizan, Jane Shore, Alice Perrers, Katherine Swynford and Margery Kempe. The people of the Middle Ages loved their Medieval food and drink. What Medieval food was consumed by the rich nobles or the poor Medieval peasants? A typical Medieval Menu and some recipes are detailed. This section includes the Food which was served to a King, Spices used in the Times, Daily Meals, Medieval Food Preservation, Medieval Food and Diet, Foods of the Middle Ages, Cooking Food in Medieval Times, Drink, Fruit, Vegetables, Bread, Meat, Fish, Game and Food Recipes used during the times.